After windstorm Ali the British Isles are in for another windstorm: yet another deep low passes across the region tomorrow, bringing potentially severe and damaging winds to the region. We take a closer look at the model guidance. A new deep low rapidly develops over the Atlantic ocean just west of the British Isles and Ireland. It moves across Ireland and the UK late on Thursday and early on Friday. 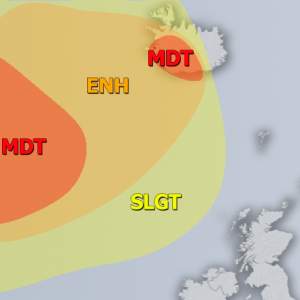 High-resolution models agree on the low resulting in a new strong windstorm across parts of the British Isles. We compare ARPEGE and ICON-EU model guidance: both models are in good agreement for peak winds across Wales, northern England and Scotland between late Thursday and early Friday. Indicated peak gusts are in 130-160 km/h range. Significant rainfall, exceeding 50 mm and locally up to 100 mm is also expected. We will be taking another look at the latest model guidance tomorrow morning, to provide an update on the latest track and strength of the system. Stay tuned!